U.S. Rep. Jerry Nadler (D-NY) speaks at a press conference announcing the 100-day deadline for people whose health has been affected by the September 11 attacks to file for economic compensation through the "9/11 James Zadroga Act's Victim's Compensation Fund" on June 24, 2013 in New York City. The deadline for filing is October 3, 2013. When it comes to Anthony Weiner's run for mayor of New York City, Rep. Jerry Nadler (D-NY) is not parsing words: he wants Weiner out. "I think he should withdraw, I think he needs serious psychiatric help," Nadler told members of the press today. "He should take care of his own problems and let New York figure its policies and its mayor." Nadler, whose congressional district includes a large swath of Manhattan and Brooklyn, said that the fact that Weiner — a former congressman himself — continued his behavior after he resigned should make New Yorkers question whether they can trust him. "I mean, to have done it again after what we went through in the resignation, he has shown himself to be a serial liar. 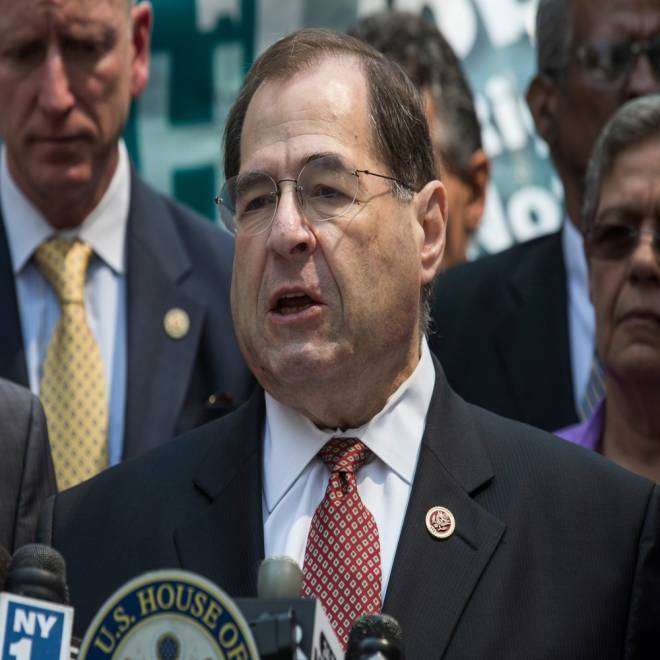 You can't believe him, and he's also shown monumentally bad judgment," Nadler said. "How can you trust his judgment as a mayor?" But Nadler wanted to make one thing clear, he also feels this way about Eliot Spitzer, who is running for NYC Comptroller. "I think that the problems that Anthony Weiner — like Eliot Spitzer — exhibited while in office, and after, pose fundamental problems to the serious governance of New York," Nadler told NBC News. "They both exhibit a fundamental dishonesty, they both lied repeatedly, and show monumental errors of judgment." Meanwhile, Weiner, sent a letter to his supporters Wednesday, attempted to refocus his campaign on the issues, saying: "This campaign isn't about me. It's about a great city that is beginning to lose its mantle as the Capital of the Middle Class. It's about the challenge of finding affordable housing, a good job with benefits and a public school that attracts the greatest teachers and produces the smartest kids. This race for Mayor isn't about me. It's about you. And I'll never lose sight of that."